The increased adoption of cover crops as a soil conservation and soil health building strategy is not without increased risk from insect pest problems. Increased insect pest risk can be managed with a combination of timely killing of the cover crop, pest scouting, and additional timely application of insecticide. The best-case scenario for the management of the cover crop to reduce insect risk is to kill the cover crop far enough in advance that the cover crop is completely dead prior to the planting of the crop. Foliar feeding insects often can survive on the dying cover crop, and if the new crop emerges before the cover crop is completely dead, the foliage feeding insects simply move from the dying cover crop onto the newly emerged and tender crop plants. This is termed a green bridge. The worst-case scenario for insect risk is to plant into a green cover crop which has been rolled prior to planting and then sprayed with an herbicide to kill it after the crop has been planted. This provides an excellent green bridge for the insects, like black cutworm larvae and armyworm larvae, to move directly onto the newly emerging crop. Black cutworm: Black cutworm is a long-ranged migrant which overwinters in the southern US. Moths typically arrive in NY during mid-April to early-May on the early weather systems. Moths are attracted to grassy areas, grassy cover crops, grass waterways, and fields with grassy weed problems. Eggs are laid on these plants and larvae begin feeding on these plants. In the situations where producers kill the cover crops or grassy weed areas with herbicide or tillage, the black cutworm larvae continue to feed on the dying plants for 1-2 weeks. When corn seedlings start emerging, the existing larvae then move from the dying plants onto the growing corn. Since black cutworm larvae do not start their cutting behavior until mid-size (L-4), the early larval development on the grassy weeds is a critical association with the economic association of black cutworm to seedling corn. In the situations where eggs are laid on emerging corn, corn development to V6, a stage where black cutworm has difficulty cutting occurs before the black cutworm develops to the larval stage where they begin cutting (L4). Since black cutworm larval development on existing plants in the field prior to the planting and emergence of the corn is a critical component in the development of economic infestations, the management of the green plants prior to corn planting is important. Elimination of the green bridge between the cover crop and/or grassy weed cover at least 2 weeks before the emergence of corn seedling dramatically reduces the risk of a black cutworm infestation in NY corn fields. If the separation between the killing of the cover crop/grassy weeds and the emergence of the corn crop cannot be at least 14 days, the corn seedlings need to be scouted for the presence of foliar feeding, early cutting and the presence of larvae. To the trained eye, pre-cutting foliar feeding is very obvious and easily detected. Armyworm: Armyworm is a long-ranged migrant similar to black cutworm, but often arrives 15-30 days later in NY. It overwinters in the southern US, and the moths emerging in April in the south use the weather systems to move long distances. When the moths arrive, they are attracted to grass hay fields or grassy cover crops. If the eggs are laid in the hay field, larvae will feed on the grass and only move when the field has been stripped, thus the name armyworm. Neighboring corn fields are then attacked by the larger marching larvae. When eggs are laid in a grassy cover crop, the larvae will feed on the cover crop until it is stripped before moving. If corn is emerging in the cover crop, they will simply move onto the young corn plants. Armyworm larvae are totally foliage feeders and do not cut plants like black cutworm. With timely scouting, this insect is easily controlled with an application of foliar insecticide. Usually, the infestation is missed until the field is stripped and the larger larvae are moving into a neighboring field. Seed corn maggot: Seed corn maggot (SCM) adults (flies) are attracted to decomposing organic material. This organic matter can range from animal manures to decomposing plant material/killed cover crop. Fresh decomposing organic matter is more attractive to the flies for egg deposition than composted organic matter; although, SCM will also lay eggs in composted organic matter. Adult flies are present for egg laying from early May until late September. The highest risk fields for SCM problems would be a green manure crop covered with a thick layer of animal manure prior to planting the crop. High manure application rates without thorough incorporation before planting of large seed crops is a high SCM risk field. Damage from SCM is plant stand reduction, and without insecticide protection, plant stands can be reduced 30%-80%. The primary reason for insecticide treatment (Poncho, Cruiser, etc) on large seed crops (corn, soybeans) is protection against SCM-related plant stand loss. Under extremely heavy SCM pressure, the insecticide seed treatment can be overwhelmed, resulting in corn/soybean stand losses. 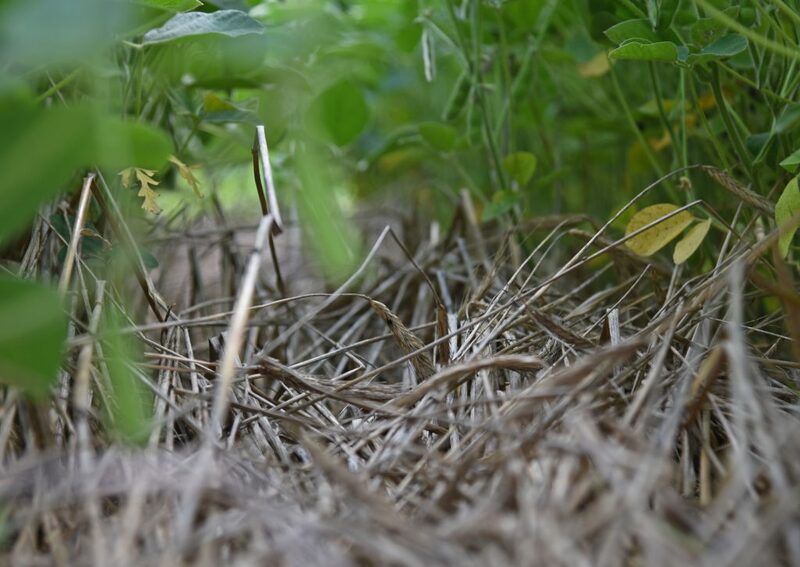 To reduce risk from SCM, cover crops should be killed and allowed to turn brown before planting the season’s crop. In addition, applications of manure should be subsurface rather than surface applied. Wireworms: Adult wireworms (click beetles) are attracted to small grains, grass fields, run-out alfalfa fields which are mostly grass, and grass-based cover crops. Adult beetles search out these hosts during the growing season (June-August) and lay eggs. The larvae (wireworms) hatch and feed on a wide array of roots for multiple years. In cropping sequences where grassy/small grain/cover crops are present in the field during the June-August period, wireworms feeding on new seedlings and root crops can become an economic problem. While corn is technically a grass, wireworms do not find corn fields attractive for egg laying. However, small grains are very attractive. Generally, spring planted grains are more attractive than fall planted grains which mature in early summer. In conventional production systems, the insecticide seed treatment generally is effective at reducing the impact of wireworm feeding. However, in the organic production system, there are no effective rescue treatments for wireworm infestations/feeding damage. If grassy cover crops are the only grass in the cropping sequence, timely crop termination before June will reduce the attractiveness to wireworms for egg laying. White grubs: In NYS, there are two different groups of white grubs which can be problematic. The first group is the native white grubs which have multi-year life cycles and the second group is the invasive annual white grubs (Japanese Beetle, European Chafer). Adults from both groups are attracted to grassy habitats to lay their eggs during mid-June to mid-July. Eggs hatch during August, and the larvae begin to feed on grass roots. In the case of the invasive annual white grubs, the larvae grow quickly and achieve more than 50% of development before winter. In the spring, the larvae resume development and are quite large when the grassy field is rotated to corn or soybeans and the new plants are quite small. Plant death is caused by these large larvae feeding on plant roots faster than the plant can generate roots. Larvae become adults in June and the cycle repeats. In the case of the native multiyear white grubs, the life cycle is similar but larval development requires 2-4 years depending on the species. Subsequent crops following the grassy/cover crop/small grain field are then impacted differently. With annual white grubs, the damage to the subsequent crop is confined to the following year only. In the case of native white grubs, subsequent crops could be impacted up to 4 years with declining damage levels each year. The following two different cropping scenarios seem to place subsequent crops at higher risk. The most common case is the alfalfa field which has become mostly grass or a grass hay field which is then rotated into a large seed crop like corn or soybeans. The second scenario is the field which has been planted to a grass-based cover crop and not killed during the June-July egg laying period. In most cases, the insecticide seed coating on all corn and some soybean seeds reduce the impact of white grubs on subsequent crops. High white grub populations can overwhelm the insecticide, however. Slugs: Increasing the organic soil cover with either the use of cover crops or last year’s crop waste increases the slug problem. In cool wet springs, which slow plant emergence and growth, damage from slug feeding can be severe. There is a little anecdotal evidence to suggest the presence of green cover reduces the slug damage because of the surplus of green tissue. In these cases, slugs miss the newly emerging plants and feed on the green cover crop.